Konzentration des Kobalds und hat nichts mit Qualitätsmerkmalen zu tun! Haltbarkeit und verhindert einen Bodensatz, wie er bei vielen anderen Goldelektrolyten entsteht. Mit diesem können Sie alle Elektrolyte auch Entchromer, Cleaner usw. eindicken. 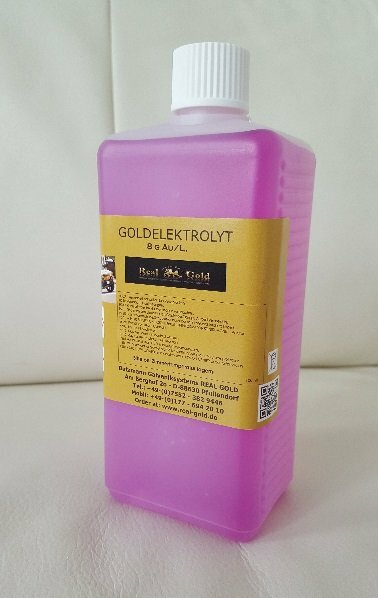 Goldgehalt: 8 Gramm pro Liter, Reizend, kein Gift! Our Gold Plating Solution has been formulated to be one of the hardest wearing and fastest gold brush electroplating solutions available. This fact, coupled with its fantastic coverage makes it our best selling product. We incorporate a preservative into the mix which gives it a very long shelf life leaving the gold in the the solution and not at the bottom of the bottle as with some other gold plating chemicals.